Friday saw testimony in Oscar Pistorius' murder trial that painted a picture the former Paralympians's defense team couldn't have wanted — that of an angry, jumpy, and constantly-armed boyfriend. Samantha Taylor, an ex-girlfriend of the former Olympic sprinter, testified that Pistorius always kept his gun at his side, once using it to threaten a driver he thought was following him, and once recklessly firing it through a sunroof in a moment of anger. Her testimony follows that of pro boxer Kevin Lerena on Wednesday, who said Pistorius once fired a gun into the ground at a restaurant and convinced a friend to take the blame. Taylor told the court that Pistorius screamed at her, her sister, and their friends, on more than one occasion. She also recalled that Pistorius "once or twice" woke her up at night, claiming he'd heard noises before going to check it out, armed. That aspect of her testimony is the only real part which could be viewed as aligned to Pistorius' defense — he claims he became falsely convinced Steenkamp was an intruder inside his bathroom, before shooting her fatally through the door. But taken broadly, Taylor's allegations weren't helpful to Pistorius' defense, none less so than a story she told — the second of such this week — of him firing his gun in public. Taylor recalled a day in September 2010, when she and Pistorius were passengers in the car of his friend, Darren Fresco. Fresco's name has come up in this trial before; it was he who Pistorius allegedly convinced to take the blame for a gunshot incident at a Johannesburg restaurant, one month before he fatally shot Steenkamp. The car was pulled over for speeding, during which time a police officer picked up Pistorius' gun from the seat, causing its bullets to fall out, and sparking Pistorius to protest furiously. As the trio drove off, Taylor recounted, Fresco joked about shooting out a traffic light "out of spite after being stopped.” She alleges that a few moments later, Pistorius, still angry about the police officer, fired his gun out the open sunroof of the car. Pistorius' defense attorney Barry Roux questioned Taylor about the sound of his client's screaming, which has become a central issue in the case — several witnesses report hearing a woman scream at the time of Steenkamp's shooting, but the defense alleges the scream was Pistorius himself in a state of distress. Taylor said that while Pistorius had screamed at her in anger before, he had "never sounded like a woman." 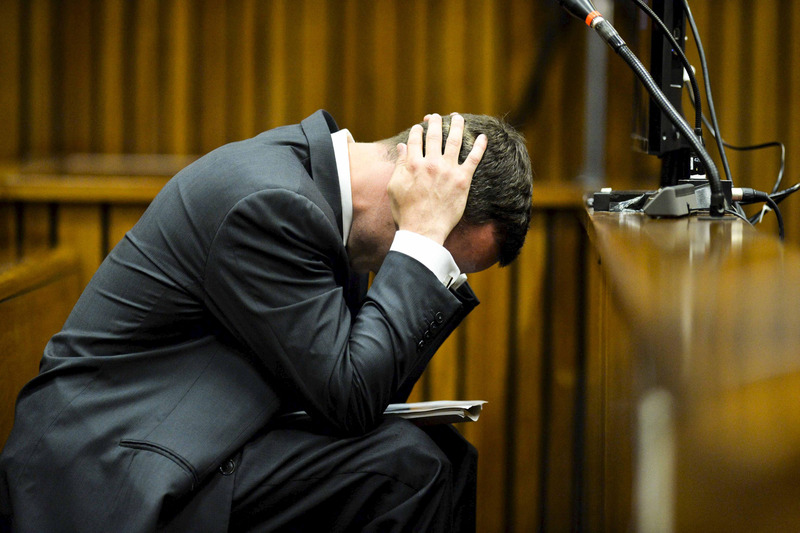 Pistorius faces a minimum of 25 years to a possible life sentence in prison if convicted.